We'll be adding some links to sites that we like in the near future. If you'd like to exchange links with us please use this code. Platinumloops - Loops and Samples - Platinumloops offers thousands of loops and samples featuring many different instruments and genres. From hip hop loops to heavy metal metal loops, from flute to tabla you are spoilt for choice. Instant access to thousands of loops and samples with lots of free demo loops available now. Silicon Beats - Drum Loops and Drum Samples - Silicon Beats offers thousands of superb drum loops available by genre in easy to download packs. Each drum loop pack contains WAV, AIF and REX2 formats and we offer drum loops in lots of different musical genres. Macloops - Garageband Loops and Apple Loops - Download hundreds of free loops in AIFF format. Loopgalaxy - Free Loops and Samples - Free loops and samples in WAV format. Hundreds to download, signup now. Beat Lease - Rap Beats, Hip Hop Instrumentals and Hip Hop Beats - Available for Lease and download. 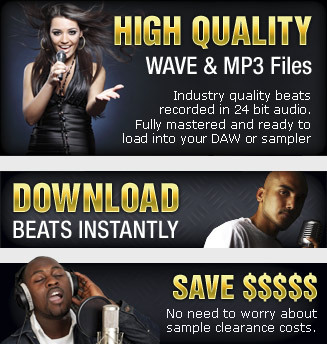 High quality WAVE files with multitrack mixes for Logic, Cubase, Protools and more. Smash Up The Studio - provide top quality sample Cds, Midi files,download sample pack, contemporary musical loops and chord progressions. Performed only by top session musicians. Sample Packs - Xylote.com offers for instant download Sound Effects, Loops, Sample Packs, Construction Kits and Royalty Free Music. Q-Music - Royalty Free Production Music - Q-Music offers a wide variety of extremely high quality production music tracks available for instant download. Preview and purchase full length tracks and loops for film, TV commercials, radio and multimedia. Music production courses - Hotwired presents music educational products, including the Hotwired Music Production Pack. Hotwired also allows you to take music classes and 1 to 1 tutoring.